The Buffalo Bulls have been the team to watch in the MAC this year. The Bulls ended the regular season ranked No. 19 in the nation and while other teams, like Toledo, Bowling Green and Kent State, have put together quality seasons, none have received the national attention that Buffalo has. The Duel has created printable versions for each conference tournament bracket and we'll be releasing the individual brackets before each tournament begins. Monday, March 11, marks the start of the 2019 MAC Tournament, which runs through March 16. The printable bracket can be found here as a PDF as well as in the tweet below. If you're looking to place a wager on any of these games, outside of filling out the bracket, FanDuel Sportsbook has all the odds and betting lines you need.
.@BleacherReport names Nick Perkins their National Sixth Man of the Year! 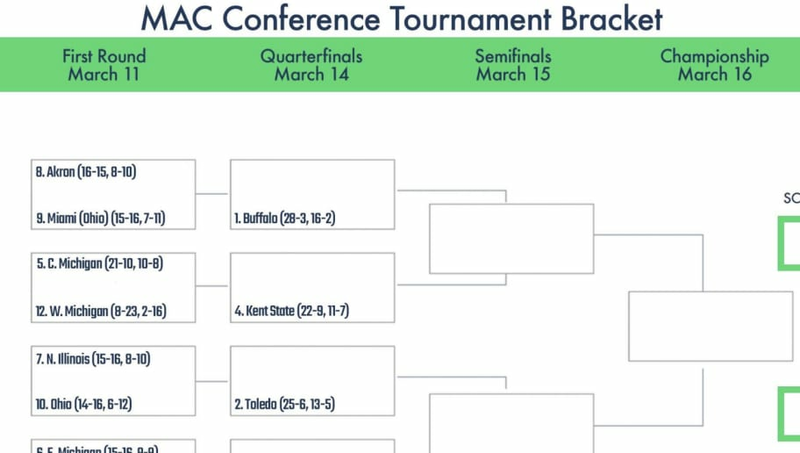 Will Buffalo live up to the national attention, or will a team like Toledo or Kent State make a statement and steal the MAC's automatic bid? The best way to find out will be to fill out a bracket and tune in to follow along with the madness. For the printable ACC Tournament bracket, click here. For the printable Big Ten tournament bracket, click here. For the printable SEC Tournament bracket, click here.